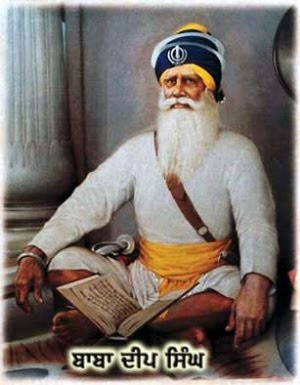 Baba Deep Singh was a Gur Sikh belonging to the village Pahuwind in the district of Amritsar. He was tall, strong, and uncommonly brave. He had received baptism from the hands of Guru Gobind Singh Ji himself. He was a bold and fearless saint-soldier, ever ready to risk his life for the Panth. He took a praiseworthy part in many battles of Baba Banda Singh and helped him to win victories. Beside being a strong and fearless warrior, he was a great scholar. In fact, he was one of the most scholarly Sikhs of his time. Along with Bhai Mani Singh, he prepared the final text of Guru Granth Sahib at Damdama Sahib with the help of Guru Gobind Singh. Afterwards, too, he stayed and worked at the sacred place. He was in charge of that Gurdwara. He spent his time in preparing copies of Guru Granth Sahib. Some he wrote with his own hands. Others he had written under his direct supervision. Copies of the Sacred Guru Granth Sahib written in his own hand or issued by him with his approval were accepted as most authentic. At the time that we are talking of, Ahmad Shah Abdali was in India on his fourth invasion. On his return from Delhi, he stayed for some time at Lahore. He had experienced a good deal of trouble at the hands of the Sikhs. Hence, while staying at Lahore, he sent out a force to punish the Sikhs at Amritsar. The city was plundered. The sacred buildings including Sri Darbar Sahib were demolished. The sacred tank was filled up. The news what had been done to the holy places at Amritsar soon reached Damdama Sahib. On hearing it, Baba Deep Singh felt as if an arrow had pierced his heart. At once he decided to go to Amritsar and avenge the insult to the sacred places there. No sooner said than done. He started immediately. A band of five hundred Sikhs volunteered to accompany him. He announced that the coming Diwali festival would be celebrated at Amritsar. Sikhs went on joining him as he went along. By the time he reached Taran Taaran, he had about 5000 men with him. All of them were eager to win martyrdom in the sacred cause. All of them bathed in the sacred tank of Taran Taaran. Then they offered prayers. They put on the dress of bridegrooms. They tied festal ribbons called ganas on their wrists. They sprinkled saffron on their robes. Thus dressed, they marched forth to wed Princess death. Jahan Khan, deputy governor of Lahore, learnt that the Sikhs were gathering at Amritsar to celebrate their annual fair. At that time, one Haji Atai Khan was moving about with a large force. His object was to put down opposition and disorder in the countryside. Jahan Khan ordered Atai Khan to march upon Amritsar and punish the Sikhs. At the same time, a jehad or holy Muslim war was proclaimed with the beat of drums. All Muhammadans were called upon to join the army of mujahids, or soldiers bent upon holy war, against rebel Sikhs. Jahan Khan was thus able to collect 2000 horsemen. He proceeded at their head to meet the Sikhs advancing under Baba Deep Singh. The two forces met near Gohalwar, halfway between Taran Taaran and Amritsar. The Sikhs fought with such force and bravery that the Muhammadan army fled in all directions. Jahan Khan tried to rally them with threats. But his threats had no effect on the fleeing mujahids. By then, Atai Khan came with a large force and artillery. His arrival turned the odds against the Sikhs. A fierce battle began. The Sikhs, with Baba Deep Singh at their head, went on fighting and advancing towards Amritsar. 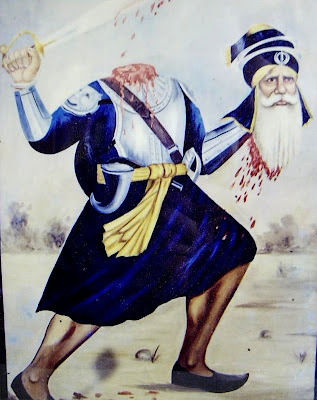 Near Ramsar, Baba Deep Singh received a mortal wound in his neck. He was about to fall. Just then a Sikh near him said, 'Baba Ji, you had prayed that you should fall a martyr in the precincts of Darbar Sahib. But you seem to be departing here.' Baba Deep Singh's head had been separated from his neck. But on hearing the Sikh's words, he rallied at once. He supported his head with his left hand. With the right hand he went on wielding his heavy Khanda, or two edged sword, cutting down his enemies. Thus fighting, he reached the precincts of Sri Darbar Sahib. His vow was fulfilled. He fell there to become a martyr. This happened in the year 1757. At the place where his body was cremated stands a Gurdwara in his memory. It is called Saheed Ganj Baba Deep Singh.